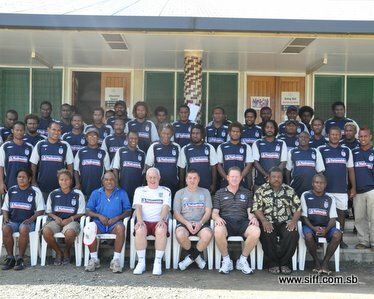 Officials from the Solomon Islands Football Federation (SIFF), the British High Commission and the English FA instructors and participants attended the opening ceremony which featured speeches and the distribution of equipment for use in the program. Speaking to the participants High Commissioner Smart said that the participants should absorb all the training that is offered in the 2 courses. “Please enjoy this week and learn as much as you can. When you take the knowledge and skills back to your homes you will leave a legacy for all Solomon Islanders. I wish you every success and offer my warmest thanks to yourselves and to SIFF,” Smart said. SIFF Vice President, Stanley Siapu offered his appreciation to the English FA and the British Government for supporting the development of football in Solomon Islands in his address. “I wish to offer my thank you to the British Government and to the English FA for enabling Solomon Islanders to have access to such training since 2006,” Siapu said. The participants were divided into 2 groups, one for the coaching component, held at the SIFF Academy and the other for the goalkeeping component which is held at Lawson Tama, after the opening ceremony. Both groups have moved straight into course program after the opening ceremony. SIFF head of the Technical Department, Noel Wagapu, said that his office is very happy to kick off the courses today and he looks forward to working with the English FA instructors through the remainder of the course. “I am pleased because this is a new level for our coaches and for our goalkeeper coaches. Solomon Islands especially needs goalkeeper coaches and I am very happy that this program is offering us this opportunity. I am sure that the participants will gain much from it and help to develop football throughout the country,” Wagapu said. The program will end Wednesday next week.